Today Doug led Don, Bob and I from Makapuu down to Greenwalls to play around in the sinking cloudbase there. We were so slow to follow that later on he called us turtles. And all this time I thought we were monkeys. Before he headed downrange Doug realized he'd dropped his GPS at Manics - he pulled off an insane top-landing to snag it, before relaunching to start the downrange mission. Once we reached the low clouds behind Olomana, Doug showed us how you could shoot out to Olomana from directly behind it in what he called a convergence line. I call that surfing the rotor. He's just a mad paragliding genius. After Doug went out there and then disappeared, Don got a wild hair and cruised out to Olomana himself, in a wide arc, super low. And then, even before I know if he was going to make it, I felt compelled to follow and try the same thing. Soon the two of us found ourselves in close quarters, milking the lightest of lift just below the top of that skinny little peak, with no good landing options in sight. The easiest LZ would be the prisons, but I really didn't want to go there today. Neither of us had ever flown over Olomana before, and it was a great feeling to be there, although we would have liked to have been as high up as Doug had been. Finally we abandoned hope of getting up and away, and we just headed towards the dump hill to see what we might find on the way. We didn't find much. Don landed at a nice big field in Maunawili and I headed past him to the dump hill, but arrived too low for any lift. I couldn't resist that nice empty soccer field right below me at Le Jardin Academy, but I was instantly greeted by several school officials, who politely but firmly made it clear that they do not want paragliders landing on their campus. I guess next time I'll have to brave a marsh landing. They did suggest that we should come and do a presentation for the kids there. Maybe we could launch from the hill above and do some demonstration landings to show them how safe we are. Bob must have known Olomana was a wild goose chase, so he stuck to Greenwalls and cloudbase, before returning to Makapuu to land and relaunch later. 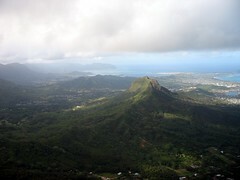 Later we found out that Doug had headed back to the Pali to continue the downrange mission, turning back just past Hygienic Valley and making the return trip to Makapuu like it was his daily commute. Lots of folks came out to join us for the final session of the day: Russell, Scrappy, Nightshift, Reaper, and Jimbo, to name a few. Nice going Alex. It must be hard for someone like Doug to have to fly w/ slow pokes like us. Once I saw how low Don was as he headed out to Olomana I figured there was no way I was going to try. You guys made it look good from my vantage point. On my way the launch I drove past some friends at a photo shoot near Sandys Beach so I decided to go land on them. Happy faces all around. Sounds like Reaper wants to open the shop for repacks by 3 PM this Saturday. I went to Le Jardin. If the club was interested I am sure I could set up some kind of demonstration with the school. I still have some connections there and some teachers I know. So what did his flight in or over the "convergence" look like? In the pic, it looks like he's turning in a thermal. Or was that rocking over a wave? Or Doug, what did it feel like? What clues kept you from thinking your glider wouldn't just ball up? I never flew behind it or in its lee. The path was clearly marked by a line of clouds and once at base I just stayed there all the way out. It was quite a good glide. I had tried earlier but it looked like I would end up low like Alex and Don so I turned around.